Chelsea's worst start to a Premier League campaign has seen the defending champions top this season's Match of the Day running order more than any other team. The BBC's head of football Mark Cole says the "soap opera" surrounding their struggles and the behaviour of manager Jose Mourinho has been tough to resist. The Blues have made five appearances in the top slot - and have lost them all. Louis van Gaal's Manchester United have been first just once. The Dutchman's side have been accused of being boring and they have featured in the sixth slot - which was the last match on two occasions - four times. 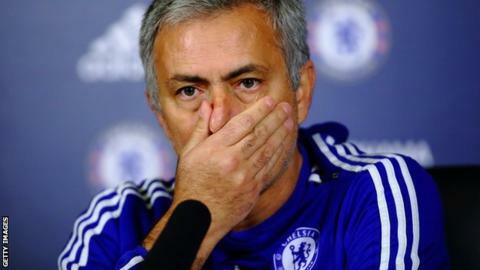 Chelsea have lost seven out of 12 in the league this season, with manager Mourinho under constant pressure. Cole said: "When the champions are losing, it is always a story. Throw in a bit of Jose Mourinho and it means they are quite often in the mix around the top of the running order. "We also look at the publicity side, in terms of what is going to be on the back pages of the newspapers, because that basically is what people want to see. "It dominates so many of the back pages and it is something there is real interest in - what is going to happen next in the soap opera that is Jose Mourinho?" West Ham - whose victories against Arsenal, Manchester City and Chelsea earned them the prime position on the main Saturday night highlights show on three occasions - are the only other top-flight club who have been shown first more than twice. Elsewhere, Everton, Stoke, Tottenham and West Brom share being on last the most times. Each club has closed the show on three occasions, while Arsenal, Chelsea, Manchester City, Leicester, Crystal Palace and Sunderland have never been on last. Of the 12 show-closing games to date, seven have ended goalless with an average of 0.66 goals per game, far short of the 4.33 goals per game averaged in the opening game.